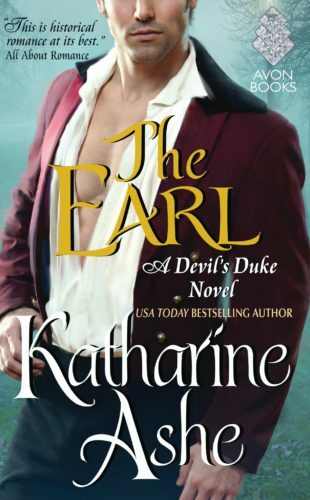 THE EARL by Katharine Ashe is a historical novel filled with adventure, mystery, and sprinkled with romance. She is a professor of History who has strong heroines that learn from and teach the men who love them. This book is the conclusion of the Falcon Club series and the second book in the Devil Duke series. All her stories are compelling and through the character’s eyes, emotions, and conflicts, readers can learn about the historical context. The banter of barbs, bickering, and debating allows them to begin to understand the other’s passion and point of view. The identity of her heroine, Lady Justice, is Emily Anne Vale, while Peregrine is Colin Gray, the Earl of Egremoor. They are constantly trading correspondence and debating over the column written about women’s issues, specifically a woman’s marital status. After Colin agrees to help her find her sister, who has disappeared, they are thrown together. He imposes one condition; they find out each other’s true identity. At the meeting place, Colin admits he is Peregrine and believes Lady Justice to be a man and insults her by demanding to see her master, the real Lady Justice. His assumptions are based on the fact that Lady Justice’s identity was never revealed. Because of her deep disappointment that the man she once knew as a childhood friend could so blatantly dispel that a woman was capable of accomplishments, Emily refused to reveal herself. The mystery begins in Scotland. It is here they trace her sister’s presence and are accused of killing a local man’s wife. It seems a man who resembles Colin and someone dressed up as a woman resembling Emily are robbing travelers. When they are mistaken for outlaws, they have to flee for their lives. Readers take this adventurous journey with the characters as they try to prove their innocence. This page turner has people unraveling the mysteries of why has Emily’s sister disappeared, will Colin discover Lady Justice’s true identity, and will they be found innocent of the crimes accused of? The novel is full of the contradictions men and women often face and struggle with surrounding the issue of equality. Looks to be more a romance than a mystery. This is billed as a historical romance but my guess is that it’s light on history & heavy on romance. How does this compare to Georgette Hayer books?